The Sixth Worldwide Pinhole Photography Day is held on 30 April 2006. Check the official web site www.pinholeday.org for details. We are having a pinhole workshop with children and parents on the day. All places are taken. This travelling exhibition was supported by Pro Helvetia, the Embassy of Switzerland, the Australian High Commission and Otago Museum. - The full exhibition can be seen at KaraArt. The Fifth Worldwide Pinhole Photography Day was held on 24 April 2005. Check the official web site www.pinholeday.org for details. The next venue will be Otago Museum in Dunedin, 16 April - 26 June 2005. This travelling exhibition is supported by Pro Helvetia - The full exhibition can be seen at KaraArt. The New Zealand Centre for Photography (NZCP) offered two of my prints in the 2004 fundraising auction. Download the Online Auction Catalogue [317KB PDF]. Four of my pinhole prints were in a GROUP EXHIBITION From Pinhole to Digital at Galeria Zero, Barcelona, Spain, 03 - 28 May 2004. The Fourth Worldwide Pinhole Photography Day was held on 25 April 2004. Check the official web site www.pinholeday.org for details. The NEW SELECTIONS section of my PORTFOLIO has been extended with images of Architecture, Bridges and New Work. Abstract/Minimalist has been added to my PROJECTS. 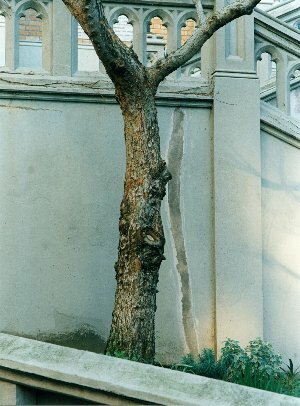 Two of my images were presented in a GROUP EXHIBITION Summer 2003 at Galeria Zero, Calle Cap de Mon 6, Barcelona, Spain, 18 July - 18 August 2003. I was invited to participate in The Tile Project. This event is organized by TransCultural Exchange and the resulting work of 100 artists will be installed in 20 public locations around the globe in 2004. The Third Worldwide Pinhole Photography Day was held on 27 April 2003. Check the official web site for details. A selection of my images was included in a GROUP EXHIBITION Photography of Architecture at Galeria Zero, Calle Cap de Mon 6, Barcelona, Spain, 4 - 29 March 2003. Impressions from the Wellington Peace Rallies on 15 and 19 February 2003.
on 1 September 2002 at 3 p.m. at the Museum of Wellington City & Sea, Queen's Wharf. This was part of Wellington on Show - Celebrating our Art and Heritage and one of four talks organised by the New Zealand Centre for Photography. My PORTFOLIO has been extended with a NEW SELECTIONS section, which will be gradually updated with more samples of my work. My Urban Tree #1 has become the cover of the Winter 2002 issue of the New Zealand Journal of Photography, the first ever in colour. I participated in another Group Exhibition Look at Wellington! 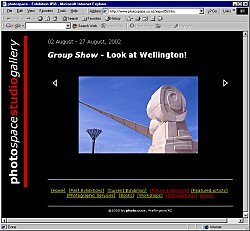 at Photospace Gallery, Wellington, New Zealand, 02 - 27 August 2002. The Second Worldwide Pinhole Photography Day was held on 28 April 2002. Check the official web site for results. I was invited to participate in The Coaster Project, Destination: The World. This event was organized by TransCultural Exchange and united the work of 99+ artists, which was displayed in 100 locations around the globe between 9 March and 19 May 2002. For more information on the project and the venues please refer to the Press Release [PDF 27KB]. My contribution was an image from my Fairyland at Home series ("Lilies"). The full set of coasters is presented at the web site of The Coaster Project, Destination: The World. Click here for Press and other reactions to the exhibitions. Images from the Wellington, New Zealand event. My EXHIBITION ... Forest of my Childhood was part of About Prints and Photographs at Galeria de l'Art Zero, Barcelona, Spain, 3 August - 28 September 2001. I participated in the first Worldwide Pinhole Photography Day and the result can be seen on the official web site. Check out the wonderful variety of work supplied. Aurora Australis (Southern Polar Light) as seen from Wellington on 31 March 2001 in PROJECTS. Frequently updated LINKS page plus an additional page with links to international galleries. My EXHIBITION Fairyland at Home was shown as part of a group exhibition titled Photo Lightscapes in Geneva, 21 Sep - 21 Oct 2000 (catalogue). I have been at the opening and it was a wonderful experience. Many thanks to Pro Helvetia and the Forum Meyrin, whose generosity made all this possible. - The full exhibition can be seen at KaraArt.